Love this app but you know how you could make it better? I can’t tell you how many years I have used this, but I have it on my computer, phone and iPad. Love this app. Time saving, so easy to add recipes too. So let’s talk about the calendar. I would love to be able to add notes to the calendar. If I am having left overs the next day, I made a recipe that said left overs. Than I add that “recipe”to the calendar. It would be so much easier to be able to note on the calendar, left overs. I could get rid of that recipe. Another example, I have a recipe on Thursday, but I need to make sure I get the frozen roast out of the freezer. I could make a note on the calendar to remind myself to get the roast out of the freezer on a Tuesday. Or I could make a note that Susie has practice on Saturday, so dinner needs to be earlier. Ok, so I don’t use that last entry as my kids are out of the house. But being able to add a note to the calendar would make this so much more useable! Thanks for reading. Great app but don’t expect much from their support! Really bad! This app is wonderful. I hate math and when I need to quadruple a recipe, YUH. The app does it for you!!!! Thank you so much. Also all those sheets of paper and torn out pages of magazines that were stuffed in a kitchen draw.....GONE. This app is so helpful and easy to use. 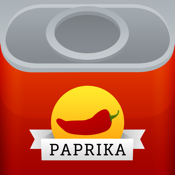 I have tried other recipe management apps but they were not as robust and user-friendly as Paprika. This one is a keeper. Good job!